In this video, we will discuss code snippets, that come with visual studio. Once a code snippet is inserted, the editable fields are highlighted in yellow, and the first editable field is selected automatically. Upon changing the first editable field, press TAB to move to the next editable field. To come to the previous editable field use SHIFT + TAB. Press ENTER or ESC keys to cancel field editing and return the Code Editor to normal. Expansion: These snippets allows the code snippet to be inserted at the cursor. SurroundsWith: These snippets allows the code snippet to be placed around a selected piece of code. Refactoring: These snippets are used during code refactoring. Surround-with code snippets: These snippets surrounds the selected code, with the code snippets code. 3. Select the code to surround, then click on Edit menu, select "IntelliSense" and then select the "Surround With" command. 3. 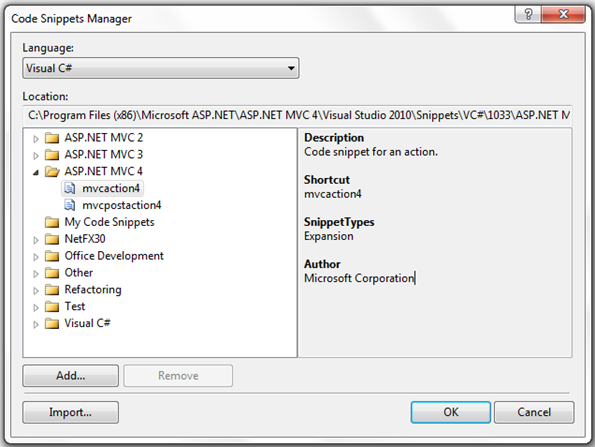 ASP.NET MVC applications etc..
Code snippets are available for the following languages. Code Snippet Manager can be used to Add or remove code snippets. You can also find the following information about a code snippet. To access code snippet manager, click on "Tools" and then select "Code Snippet Manager". Code snippets are xml files and have .snippet extension.